S M Ong: Beggar? Busker? Who is this man in Orchard underpass? Beggar? Busker? Who is this man in Orchard underpass? Last Sunday evening, I was walking from Orchard MRT station to Shaw Centre and used the underpass. As I was going down the escalator, I noticed an older man sitting on the floor beside the escalator who seemed to be in distress. A woman was squatting next to him and a third person was standing a few metres away taking pictures of them. At first, I thought the man was a beggar because the only people I had ever seen sitting on the floor in the Orchard underpass had been beggars. But as I walked past the trio, I noticed the man appeared a little too well dressed to be a beggar. Then I thought maybe he was a busker because the Orchard underpass has long been a favourite haunt for street musicians, perhaps attracted to the acoustics of the tunnels. Ooh, echoey. And since Singapore Idol is no more, the underpass with its constant flow of captive audiences is the next best thing. So was the man a busker? But where was his instrument? A busker usually has a guitar or keyboard or something. A-ha! Maybe he was distressed because he lost his instrument. And the other two were tourists who wanted to have their picture taken with a Singapore busker even though (or because) he was distressed about losing his instrument? What a strange thing to do, I thought. But then I had seen many strange things I don't understand, especially around the Orchard Road area. I just tried not to stare, kept calm and carried on. Earlier that day, I saw a group of people playing drums outside Paragon, which I didn't understand. Was Orchard Road not noisy enough already? I couldn't get away from the loud, hearing-damaging drumming because I had to wait for the traffic light to change before crossing the road. Then, to my dismay, I saw another group of drummers on the other side of the road getting ready to assault my ear drums. They were everywhere! So I took refuge inside the Abercrombie & Fitch store at Knightsbride and my eyes were ambushed by the startling sight of a shirtless man at the entrance. He had weird bulges on his body that may or may not be muscles. In other words, just another typical weekend on Orchard Road. The next day, on my Facebook newsfeed, I saw a Stomp picture that looked surprisingly familiar. It was a picture of the old guy and the squatting woman I saw in the underpass! 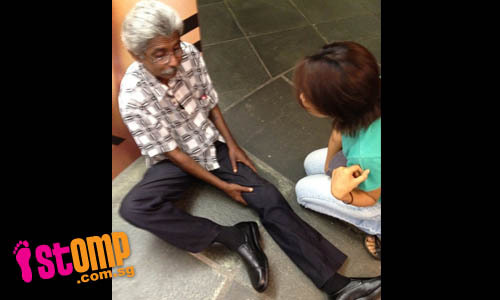 The Stomp post was titled “Injured old man crying in pain at Orchard Rd, but no one stops to help”. Oh, the old man was injured? I didn’t know that. So that was why he was in distress, not because he lost his guitar. "This poor man was seen lying slumped against the wall at the escalator below Tangs at the underpass leading to Orchard MRT. "Half an hour later, he was on the ground and pleading for help after trying to make his way home. My wife, who is nurse, immediately ran over to help. It seemed that he had fallen down a flight of stairs earlier on. "No one had bothered to help him when he fell again. He was writhing in pain and was in tears and no one bothered to help him. "We then alerted SCDF as he had a probable fracture and could not move any further. "Can you imagine the human traffic flow in the underpass on a Sunday evening? Crowded and yet Singaporeans just continued to pass by totally ignoring his pleas for help. "The only human that day was a lone foreign worker who had ran off to the MRT control station to seek help. 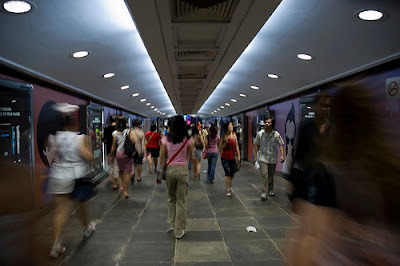 "Even the MRT staff left the situation to my wife, probably as it wasn't on SMRT grounds. "When a Ferrari driven by a foreigner crashes, the whole nation comes together blasting the driver. "When a fellow citizen is down and in need of urgent medical assistance, a blue-collar foreign worker comes to his rescue. "The best part, countless number people just looked and walked past. "Where are you, Singaporeans? Minding your own business?" Whoa! Why do I feel like I’m being scolded? But if I had known the man was injured or heard his “pleas for help”, I would’ve minded his business. But if I see that someone else is with him, I would assume he was already helped and my assistance is no longer required. And how did this minor incident become another Singaporeans-versus-foreigners issue? I find it more troubling that someone would take a picture of the injured man just to send it to Stomp to make the point. I’m already avoiding sitting on the MRT train lest someone sends a picture of me not giving up my seat to Stomp and accuses me of being unchivalrous. Now it seems I have to avoid Orchard Road’s treacherous tunnels as well. I read ur article this morning. It is rather weird that no one stopped to help the injured man. There was no signs of him asking alms or him playing any instrument. How can the crowd be so blind? and that too on a Sunday where Orchard is packed like a can of tuna? I have been noticing this from young that Singaporeans always put a blind eye when their help is needed. Why? Are all Singaporeans suffering from self esteem issues or are they just heartless? When a hp rings in the MRT or when someone accidentally drops something, everyone stares at that person. It is just so silly. It is so embarassing that Singaporeans behave in such a uncivilised way. Another issue i would like to bring about. Singapore is being defined as a diverse, multi-cultural country. I totally disagree. I have witnessed people giving up their seats to a Chinese old lady but not to an Indian man or lady. So may i ask you, will u help someone with a different race? I hope your answer is yes. U state in the article that you have been taught to mind your own business. So, you would turn a blind eye when someone is injured or crying in pain? We should never assume that if someone else is with him, then he is safe. We should always be vigilant as that person might one day be our loved ones. Regarding the Ferrari accident, Singaporeans are just using this as an excuse to drive PRcs out of Singapore. Not all of them are concerned with the taxi driver's death. It is high time that Singaporeans wake up and realize that humanity is above all values. I just wanted to express my views. And one more question before i end. Why is this article under humour? I really do not find anything humorous about a man getting injured. MY REPLY: Agreed, there's nothing humourous about a man getting injured. But I think there's something peculiar (if not exactly humorous) about people taking a picture of an injured man and sending it to Stomp.